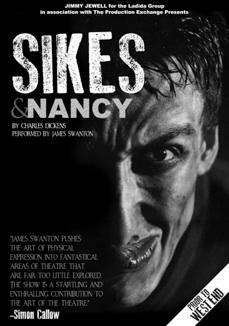 Sikes & Nancy is James's most enduring one-man play: a macabre and pitiless maelstrom of grotesquerie, terror and bloodshed. 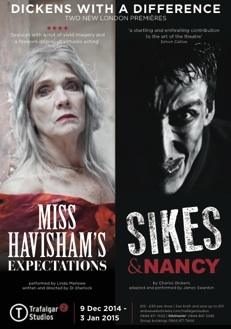 After a number of shorter showings, Sikes & Nancy toured the country from September to November 2014, before settling into the West End's Trafalgar Studios for Christmas (alongside Linda Marlowe in Miss Havisham's Expectations). Sikes & Nancy last surfaced in November 2016, playing a sell-out run at Jersey Opera House. One man dressed entirely in black enacts the compellingly terrible story of Dickens's most famous murder. Swanton's tour-de-force performance of this masterpiece of Gothic melodrama sees him transform himself seamlessly from the revolting Fagin to the unfortunate Nancy; from the righteous Brownlow to the ferocious and terrifying Sikes. This is bravura storytelling at its very best: exciting, dark, physical and brutish.